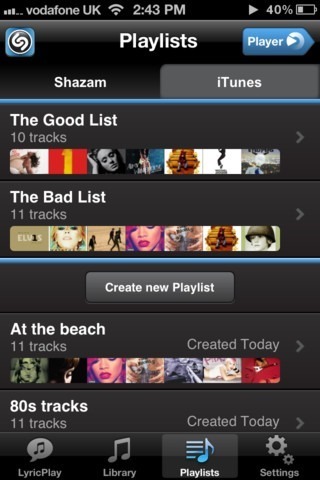 Anyone interested in music for their devices over the years has I’m sure heard of the Shazam service. When the company first started, it would allow users to identify music by way of their mobile telephone. You had to dial a number and then hold the mic up to the music so that the service could get a sample. The service would then connect to the company using your data connection and then send a text back to you with the name of the song and the name of the artist. The way it works is to create an acoustic fingerprint of the music that it hears through the mic and then it does a comparison against the database for a matching song. With the success and their forays into various smartphones, they have recently focused their energies on the development of a new music player application. It is be touted as an app that will be free and whose purpose is to replace the current iOS music app. It is also advertised as offering more features and functions than the one that is offered through Apple. You are supposed to have synced lyrics, a lot or biographies of various artists, smart playlists and of course social sharing abilities which will let users share their content with Facebook and Twitter to name just a couple of the social media sites. Here is a little more about one of the features. The feature is known as LyricPlay and what this does is if you are in the music player app, users can view lyrics from songs directly in their own music library. The one drawback is that this is subject to licenses from the owners and at the present time there are only about 50,000 sets of lyrics. This may change over time as more licenses are obtained. Another feature that is the top tracks listings. This has been included into this app and what it does is to connect users with music and content that they may not know about but is currently popular. 0 Respones to "Shazam and the New Music Player App"